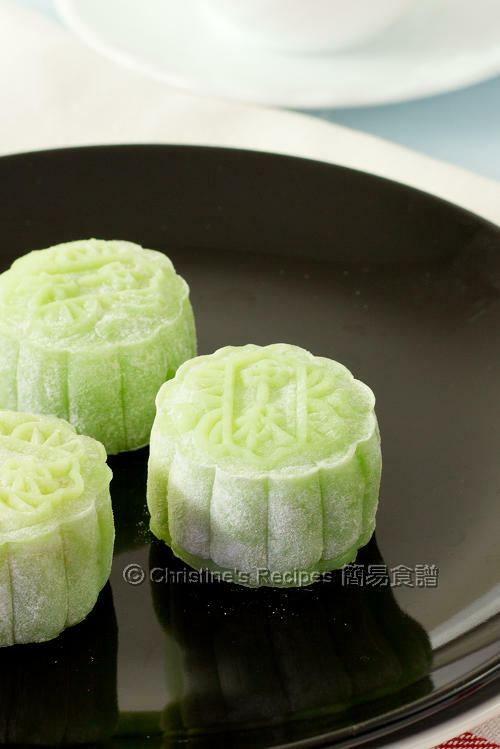 How nice to make these fragrant pandan snow skin mooncakes for Mid-Autumn Festival? It's fun and divinely tasty. Step-by-step photos are in the recipe below. Mid-Autumn Festival (aka moon festival or mooncake festival, 中秋節) is one of the important festivals in Chinese calendar. I’ve grown up from a family that would have store-brought mooncakes every year. Since I moved to Australia, I’ve been pondering over the idea of making my own mooncakes. After many years, I made some traditional and trendy ones finally. Coconut milk and pandan juice often go well together in making Chinese dessert. Off I went with this idea and made these mini snow skin mooncakes for our church gathering. The smell, taste and colour of both coconut milk and pandan are very unique, that you hardly find any other things to replace them. Fresh pandan leaves are not common here. I could source some frozen ones though, and was glad that it was a big hit in our gathering. In a large mixing bowl, combine glutinous rice flour, rice flour, wheat flour and sugar well. 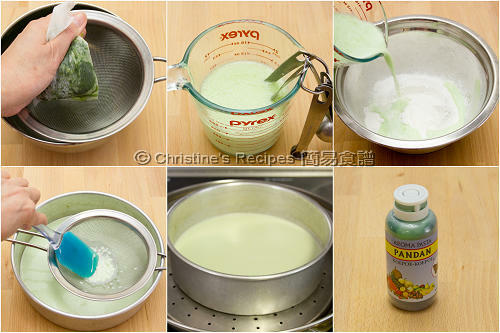 Mix milk, condensed milk, pandan juice and oil together. Pour into the flour mixture and stir to combine. Drain through a fine sieve into a large and shallow pan. Steam the batter in a wok over medium-high heat, for about 15 to 20 minutes. Try a bit of the dough. If it doesn’t have any raw flour taste, it’s cooked through. Remove from wok and let it cool down. Scrape the dough out onto a plastic board or a kitchen benchtop lined with plastic film. Lightly knead by hand until smooth. Cut dough into 16 portions, 30 grams of each. Divide mung bean filling into 16 portions, 20 grams of each. Roll each into a round shape. Wrap each filling ball with a dough portion. Roll with your palms and lightly coat with cooked glutinous rice flour. Shake off any excess flour. Place into a mooncake mould. Press to print the pattern. Repeat this step until finish all the dough and fillings. Store the mooncakes into an air-tight container. Put kitchen paper on top to prevent any condensed water dropped on the mooncake surface. Refrigerate overnight. Enjoy. Rinse 4 pieces of pandan leaves and wipe dry. Roughly cut into smaller sections. Use an electric food processor to process the leaves with 4 tablespoons of water until finely cut. Transfer to a filter paper. Squeeze out the pandan juice. Then measure out the amount yielded by the recipe. The rest of the pandan juice can be stored in fridge with cover for up to a few days. How to prepare cooked glutinous rice flour: Simply cook the flour in a frypan without any oil over medium-low heat, stirring occasionally. When smoke releases and the flour turns light yellow, it’s cooked. Remove from the heat and let it cool down completely. Then you can use it to coat your mooncakes. If you don’t have a mooncake mould, you can use a jelly mould or any other mould that comes in handy to you. If pandan leaves are not available, you can replace it with milk. Add more pandan paste if you like a deeper colour. When the dough is still hot, it seems to be quite oily. Don't worry. It won't be greasy at all, when it cools down completely. The snow skin mooncakes can be stored in freezer up to a few weeks. Before serving, just transfer the mooncakes to fridge for about 3 hours, until they become soften a bit. Christine, I can imagine the taste, sure very fragrance and yummy. Amazed that many of my group members started making these mooncakes, more than I did. That's some lovely mooncakes here. I like the delicate green which I always associate this color with the fragrance of pandan. Like this kind of semi-translucent feel of green. My 'dough' turn out to be very oily!? Instead of pandan juice I used coconut milk. That should cause a problem? I do wish it work. If the dough completely cools down, you won't feel it oily at all. These look cute and nice. The combination is just divine. What do you mean by standard size? How big is your mooncake mould? Do you know how many grams of a mooncake it can make with it? Your mooncake mould is much bigger than mine. If you want to make this ice-skin mooncake using your 125g mould, you might try using 75grams of dough to wrap 50grams of filling. For making traditional ones, you might try to use 40grams of dough to wrap 85grams of filling. Hi Christine, May I ask, if I am using the phoon huat Snowskin premix, how should I adjust from ur recipe? Thank u. If it's snowskin premix, you just need to follow the instructions on the packaging, then add a few drops of pandan paste into the mixture. Yes, my mooncake mould is 50g. I've seen in other recipes that they require to use koh fen for the snow skin. Does this recipe actually use glutinous rice flour and not koh fen? Also, how long in advance should we make this in time for Moon Festival? Koh fen (糕粉) is cooked glutinous rice flour. I just made some to coat the dough. You can use koh fen if you like. Thanks for the quick reply. Just to confirm, we can just use glutinous rice flour (koh fen is not required)? If you follow this recipe, you don't need to buy koh fen, just use glutinous rice flour. Based on your delicious Pandan Snow Skin Mooncakes with Coconut Mung Bean Filling photos, we'd like to invite you to submit your food photos on a food photography site called http://www.foodporn.net so our readers can enjoy your creations. hi! if i use koh fen to replace glutinous rice flour, is it the method are same as shown above? Koh fen is already cooked glutinous rice flour. So you don't need to steam it. Just follow the instructions on the packaging of koh fen, then add other ingredients you like, for an example, pandan juice. And then knead into a dough. Wrap fillings inside. thank you very much Christine! i got another question.. if using koh fen,do i need to add on with wheat flour and rice flour too?? Oh, you have to use the koh fen premixed for making snow skin mooncakes. If you add other kinds of flour, you still have to cook/steam the flour mixture because other flours are not cooked yet. I would like to know the size of your moon cake mold? Diameter? There is a wide variety and sizes that can be purchased on the internet. The diameter of my mooncake mould is about 4.5cm. I got it from Hong Kong. You might try ebay to see if you have luck. Hi Christine, thank you for posting this wonderful recipe. One question, can I substitute wheat flour with all purpose flour? Sure, you can substitute wheat flour with all purpose flour. The texture of end product will be different though. I wonder if there's any substitute for wheat flour and corn flour? Are they the one that you get from Asian store? Thanks! Yeah, you can easily get wheat flour and corn flour from any Asian stores. Thanks! is it possible to use potato starch (it says 生粉) to replace corn flour? This recipe doesn't call for any potato starch. Don't quite get your question, sorry. I found that you have used corn flour in another recipe of yours, "Ice skin mooncake with custard filling". So I am just wondering if i'm able to use potato starch to replace corn flour in that recipe. I haven't experimented potato starch with that recipe. Yet you can give it a go to see if you would like it. Hi christine, your mooncakes look good. Wld like to try to make it. If I don't put pandan paste/essence, will it affect the mooncake taste? Should I put a bit more pandan juice instead to make up for the lack of pandan paste/essence? If yes, how much pandan juice should I put altogether? Thanks. If not using the pandan paste, it won't affect the end products at all. It only helps to increase deeper colour and fragrance. If you only use freshly squeezed pandan juice, you can add any amount to your liking, just subtract/take out the same amount of milk. That's easy. Thanks for your prompt advice, Christine. Happy Mid-Autumn Festival to you! But the 190mls of milk made the dough very, very sticky.. Should I lessen the milk? So glad that you made it and liked this recipe. The moist including the milk is for keeping the dough soft for days . I won't recommend to reduce any milk. If you find the dough is too sticky to handle, wear plastic gloves and roll the dough on a plastic board. It's much easier to work with. I am Indonesian and very familiar with Panda paste you are using :D.
Am thrilled. Thanks so much for your love of my recipe. how do I can order your cook book Christine? Please check this post and you'll get all the details on how to order my cookbook. I click in Post but I still couldnt order your cook book, please tell me how to order your cook book by English. Just only "yesAsia.com" working but they dont ship to USA and Canada. Can I order from you? I used to live in Hong Kong but had to return to Germany a couple of months ago. Your recipes just make me miss my second home, can't stop making all those fantastic treats! I have a quick question, how can I prevent contamination from handling this product (aside from wearing gloves) since the 'dough' is already cooked when I put the filling in? Is there an extra step I can take just to ensure that what I will be serving is germ-free? sorry, except wearing gloves, can't think of any other methods. Some of my friends just use their clean hands to make mooncakes. Seems that they don't have any problem at all. Thank you for your support of my cookbook! Hi! I really want to make this recipe! I used 50 grams mould. It's easier for you to get the same size of mould. hi! if I want to use the 100 gr mold, what's the ratio of filling and pastry that I should use? Thank you! Simply double all the ingredients. 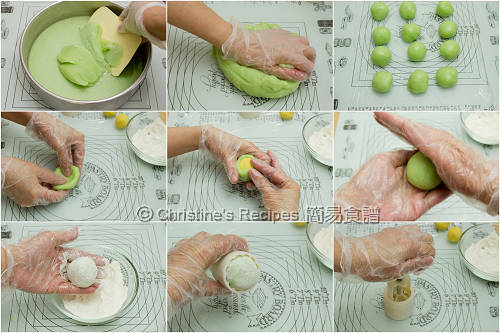 Hi Christine, with the recipe and size of the mooncake. What size of mold you using ya? Mentioned in the recipe, 50 grams mooncake mould. Just want to ask you, what's the difference between this recipe and the Ice-skin mooncake (http://en.christinesrecipes.com/2009/09/ice-skin-mooncakes-with-custard.html) you shared before this? They are a bit different in texture and taste. That's the formula I tested. All purpose flour doesn't work for making snow skin mooncakes.